I work in a daily newsroom, which is to say I spend a lot of time gossiping. Not long ago I overheard some of my copy desk colleagues comparing notes about who had “killed” the most newspapers, in the sense of surviving shut-downs or mergers. I stunned them into a momentary silence when I said that I had started a newspaper. In 1989 I co-founded an alternative monthly, the North Coast Journal, in Humboldt County, California. My wife and I sold it when I began the odyssey that led to my current job as Silicon Valley reporter for the San Francisco Chronicle. But the Journal endures. Moreover, the publisher who bought it from us has since then taken it weekly. I have other media startup and turnaround experience. In 1974, as a U.S. Navy journalist, I started a closed-circuit radio and television station aboard a ship. The audience was small but the feedback was immediate. I’d finish my nightly newscast and stroll down to the mess desks to get an earful from the crew. In 1980 I became editor-in-chief of the financially-troubled Daily Californian, the independent student newspaper of UC Berkeley. There, I presided over a financial comeback. I graduated that same year and started a typography shop in Eureka, California. It eventually spawned the monthly I mentioned above. (In a four-part blog essay titled, “The time I bought half-interest in a newspaper from a guy with wooden teeth,” I discuss my first failed attempt to start a community paper.) Since 1992, as a business reporter covering Silicon Valley, I’ve seen companies and industries rise and fall. For the last two years I’ve been blogging as MiniMediaGuy to wrap my mind around the technologies, personalities and possibilities in new media. I know media, big and small. Ditto for business. For more than three years I’ve been blogging my heart out in minutes squeezed between a full-time job and my duties as a husband and father. Why? Because I believe journalism can and must thrive. I just completed a mind-expanding week at the Knight Center for Digital Media in Berkeley and was exposed to five programs — Photoshop, FinalCut Pro, GarageBand, Soundslides and Flash — along with 19 other journalists and I only want to quarrel with one point I heard during six long days of training: I think journalists have to invent ethical new ways to make money from their work. A remark to the contrary at the end of the session reminded me how profound a cultural revolution journalism will have to experience to re-establish its support system. 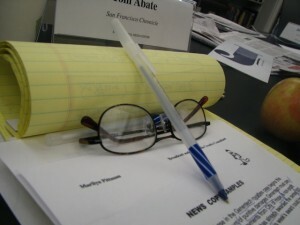 Professional journalists have eschewed money-making. Someone else did that; it was up to ad sales or classifieds or circulation. But those systems are eroding. If journalists don’t re-invent ways to get paid for their services they are doomed to extinction. So it seems to me. This entry was posted in money-making media on October 9, 2010 by Tom Abate. I just spent a mind-expanding week at the Knight Center for Digital Media in Berkeley and was exposed to five programs — Photoshop, FinalCut Pro, GarageBand, Soundslides and Flash — along with 19 other journalists. I am not quick on the uptake. I grasped only a small amount of what was thrown at me by a patient training crew. But I did produce a Soundslide story and observed or assisted in a slew of other tasks. I got over my fear of video editing and realized that basic Flash was within my grasp. I have the confidence to get the refreshers and advanced training that I would need to become a proficient multimedia journalist. I understand how to let the story choose its media, and have at least some sense of how to get the story done. It was the longest six long days of training I’ve had in a good long while. And great fund. Only one point I heard caused me to disagree. I think journalists have to invent (ethical) new ways to make money. A remark to the contrary at the end of the session is what prompted me to disagree. Professional journalists used to look down money-making. Someone else did that; ad sales or classifieds or circulation. But the old systems are eroding. If journalists don’t invent ways to get paid for their services they are doomed to extinction. Or so it seems to me. This entry was posted in Attention Economy, Media trends, money-making media on June 19, 2010 by Tom Abate. Newspaper ad revenue is where it was in 1982 in inflation-adjusted dollars . . . paid circulation per capita is half what it was in the 60s. I ran into Varian last week and asked what this means for print news professionals who hope to gain more e-readers as print subscribers dwindle. First, he said, most of that 70 seconds of online news consumption occurs at work, so newsies will have to engage the audience into consuming more news on their own time. That means making online news reading more like the habitual leisure activity that it is for print subscribers. How will newsies convince the audience that the electronic news product is worth more of their attention? Varian thinks this will entail adding multimedia elements to make online news more engaging and entertaining. “You’ll be competing with television,” he said. What a tough transformation for shrinking news staffs whose incumbents have few multimedia skills. Thanks to my friend Howard High for alerting me to Varian’s analysis. This entry was posted in Attention Economy on March 14, 2010 by Tom Abate. Will content become a serf? People used to say that content was king. Amid the recent upheaval in mass media, Time Magazine recently demoted content to a pauper. But an article in the current issue of Wired makes me think Time set the bar too high. Content — or at least content creators — may be headed for serfdom. The story is about Demand Media, a privately-held Web company that will earn $200 million in revenues this year producing thousands upon thousands of content bits using a combination of algorithms and freelancers. The algorithms sift through search terms to anticipate what people might want to know; determine whether there is a glut or surfeit of content in that regard; then estimates the likely revenue-potential of that content through pay per click advertising. Human freelance editors turn these machine-generated leads into topics that are posted on a work board (Wired author Daniel Roth says, “It’s the online equivalent of day laborers waiting in front of Home Depot.”) Freelancers claim the topics. Short how-to articles may be worth $15. Brief videos $20. Surely that bodes ill for content creators. This entry was posted in Media trends on November 7, 2009 by Tom Abate. Working at the center of the newspaper industry meltdown has been humbling. I can’t recall how many goodbye cakes I’ve tasted in the last few years. I’ve quite lost my appetite for them. Propping up troubled papers has a cost. It weakens the enterprises that are rising from below to compete with them to deliver advertising and, yes, deliver news. If market forces doom incumbent media that doesn’t mean using news to build a community can’t be a money-making venture. It just means new people with fresh ideas will have to figure out how to do it. Meanwhile, as one of the incumbents who hasn’t been moved out or moved on, I have to work harder and think differently, because this is an interesting time to be in media. This entry was posted in Media trends on October 5, 2009 by Tom Abate. You have to go back to 1965 to find a year with revenue lower in 2009 dollars than what this year is projected to be. That year, the industry took in $4.42 billion, which works out to $30.22 billion in current dollars. The industry can only hope this year hits 1966 levels, which work out to $32.4 billion in real dollars. This entry was posted in Media trends on August 21, 2009 by Tom Abate. Although I had forgotten completely about the Navy and journalism, chance intervened. My mother’s birthday is in February and I went over to visit her one day. While I was in her kitchen the phone rang. It was Petty Officer Hall. There was an opening in the Defense Information School, the training site for military journalists. Did I still want to enlist? He had to know and get me signed up in order to guarantee me the training. I remember standing there thinking that this must be karma. I rarely visited my mother. If I had not been there at that very moment it is doubtful that I would have gotten the message or acted upon it in time. So I said yes and took the train back to Coney Island to sign the papers. A few weeks later I went off to boot camp to complete basic training and be indoctrinated as a sailor, which was the prerequisite to getting the journalism training that I wanted. Boot camp was a memorable experience. It is an exercise in brainwashing accomplished through a great deal of yelling and insistence on following meaningless rules just for the sake of building the habit of taking orders. If I close my eyes I can still remember the hot bourbon-and-tobacco breath of my drill instructor, Petty Officer First Class Gibson, standing almost nose to nose with me, screaming, “Do I look like your momma, recruit?” One instance from that 9-weeks of calculated abuse pertains to my journalism saga. It was about midway through the cycle when I was told I had to take a typing test to qualify for the journalism training program. I used an old manual typewriter. I had to type either a dozen or 15 words per minute accurately. I failed. The boot camp authorities told me I could not go to the training program. No problem, I said. You can send me home. Because I was guaranteed a spot in the school and if you can’t hold up your end of the bargain, I should not have to finish my enlistment. I would have been more than happy at that point to call the whole Navy thing off. But whoever was in charge of such decisions figured it was the journalism program’s problem to teach me to type. Boot camp couldn’t afford to lose a recruit. This entry was posted in Essays on June 22, 2009 by Tom Abate.